Google recipe search is a great recipe search engine that is integrated into Google search result, a search engine most people are familiar with. You can search for recipes right from Google homepage as the rich snippet feature in Google enables results to showcase thumbnails and other rich data associated with recipe results. Publishers of food recipes can take advantage of the rich snippet feature and Google search by pushing their data to Google recipe search.Making a new meal has never been so easy what with thousands of recipe websites telling you how to make great meals. Google recipe search is fantastic recipe search engine that aggregates some of the best recipes around the world. Google recipe search features ratings of all their recipes that have been voted by the community, which is a powerful feature that helps users decide which is the best trending recipe that users around the world like. 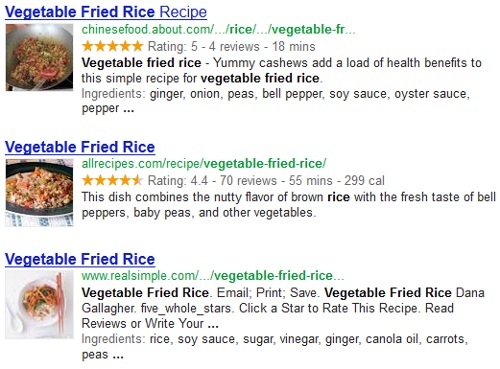 For example, a search for vegetarian fried rice on Google search will display numerous results of vegetarian fried rice recipes in google recipe search. The search results are accompanied with thumbnails of the dish. Rich data is pulled from various websites that have thousands of recipes and Google recipe search aggregates it in a seamless and aesthetic way. The rich snippet accompanying each recipe in the search results include data like ratings, calories, cooking time and ingredients. Use the search tools feature in Google search results to filter your search results. Click on search tools and filter options will show you various recipe related options you can filter by. The Google recipe search by ingredient type is a great addition to Google recipe search as it enables you filter recipes in the search result by ingredients. If you kids don’ t like a particular ingredient like basil, then be sure to use this filter to remove its from the search results and Google recipe search will only show you recipe results without that ingredient. 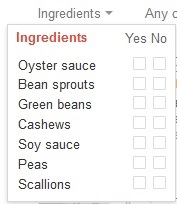 Ingredient search is also helpful if you know people are allergic to some ingredients. Sometimes, substitutes are available while preparing a meal, and Ingredient search is a perfect way to remove ingredients that are not suitable for everyone. Filtering Rrecipe search results by coking time is very imperative especially if you plan on cooking weekdays or holidays. Time is very important especially if you have to cook for a large family and you can filter all the recipes by coking time to quickly prepare a meal. If you are not bothered about cooking time of the recipe, then Any Time is the default setting. 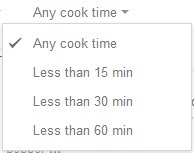 If you are a busy person, using this feature to trim cooking time can save you a lot of time allowing you to enjoy the meal and spend more time with family. If you are fitness conscious you should pay special attention to the calories each of these recipes contain. Each recipe has a calorie count and this is very important when you prepare the meal. 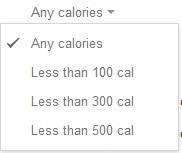 The ability to filter recipes bug calorie count is another great feature in recipe search as it allows you to select and view recipes in particular calorie ranges keeping your fitness in mind.